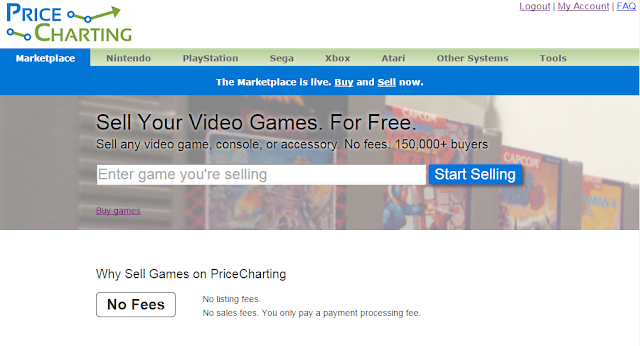 Today, PriceCharting launched a free video game marketplace. That's right. No listing fees. No selling fees. No buying fees. The only fee is for payment processing but that doesn't go to us. Objective conditions - sellers use conditions like 'brand new', 'writing', 'torn label', etc instead of 'good', 'acceptable', etc. You can filter results by these conditions. Know what's included - sellers choose exactly what is included, 'game', 'box', and 'manual'. You can filter results by what is included. For now the marketplace is only available to US buyers and sellers. We plan to add Canada in the near future and other countries after that, but we don't have an exact timeframe for this expansion. You can search for a game to buy or you can browse all the newly listed games too. I'm very sorry for any troubles setting up your seller account. Where do you run into the problems? Is it creating an account on PriceCharting or creating a Stripe account? Thanks for the feedback about Paypal as a payment method. When linking Stripe to your website it was asking for my website. I don't have one, so I didn't know what to put in. Now, I put your website and it worked. Thank you for letting me know about that hangup during the process. The url is supposed to be pre-filled and removed from the form for users but apparently that isn't happening correctly. I'll look into this to see what is going on. 1. Is there any protection against scamming? 2. Would you consider adding cryptocurrencies as payment methods in the furture? @snip - Great to hear about the marketplace success. @anonymous - Glad you like the potential. We do accept Bitcoin now on most items on the site. Sellers have to opt-in to Bitcoin though. Roughly 90% of the items on the marketplace now accept it though. Regarding protections. We have reputations on the site so buyers and sellers can make informed decisions about who to deal with. As a marketplace, we do not provide protection. But every purchase is guaranteed by your credit card. If there is any problem that the seller won't resolve you contact your card and they will fix it. I'm definitely a big fan of the new market. I'm able to list games for cheaper than I would in other locations, while still making a profit. It's win-win for all involved! On top of that, I can have a lower floor price that's still worth shipping and selling at. As a matter of fact, the game I sold, I sold for under $5, while on other markets, I don't list anything for under $9-10. Regarding the listing process, as it's right now (due to some recent changes on one of the other platforms) the simplest listing process, that makes it my new favorite listing process. The only things off the top of my head that I'd like to see changed are an internal field to keep track of the SKU and possibly lengthen the amount of characters that can be added to the product description. Thanks again for your entire website, it's awesome! @Salmononius2 - Thank you for that extensive feedback and thanks for selling on the marketplace. We hoped the marketplace would be a win-win for everyone, in the exact way you said. Lower fees for seller and lower prices for buyers. Please share your experiences on other gaming forums/sites you frequent. The marketplace is new so many people want to hear some first hand experience. We are a free marketplace so we can't spend a ton of money on marketing. We are going to rely on users like you helping to spread the word.